I had what I thought was a short in my bathroom lighting. 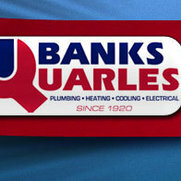 I called Banks Quarles and someone was sent out that day. I received a quote as soon as the situation was reviewed and he was sure I understood what he was talking about. Thankfully, he found my problem....the house would have caught on fire if he hadn't. The wiring was bad. My house was built in 1960. He couldn't even touch the area the light was in because of the heat. He did not leave my house until he got in my attic and checked out all wiring to be sure my home and my family were safe. I have used them again since and they are wonderful.